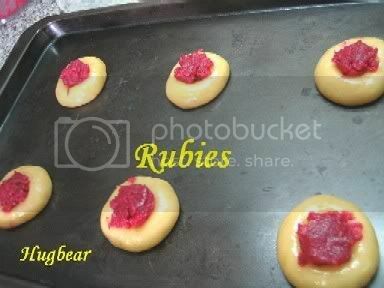 These are edible rubbies ) but still precious. How's the texture like? Crunchy? Melting in your mouth )... It is a soft cookie but holding very nice. I just bought a pack of fresh cranberries and was wondering what can I do with it besides making juice out of it. Will try this recipe soon. Thanks! BTW, how do you prepare your cranberry sauce? Do you use water or juice? This recipe yields 200 pcs? I don't remember how many batches I made last Christmas... you could try half the batch and see how many you get. But I know this much... from a size of a ping-pong ball... the cookie expands about 3 times the size. Thinking of doing these precious Rubies later. I only have organic raspberry jam. Can I use that instead of the cranberry sauce? But I would add some cornstarch to the jam, in this way the jam won't run. You see, the cranberry sauce has cornstrach in it and it's on a thicker side. Some how my rubies ain't as luxurious looking as yours. Thanks for the link, Vi. BTW, I see your cookie is quite flat whereas Linda's rise up tall. Is it because her indent is not deep enough? Or you flatten your dough slightly before making the indent? Linda... tell me more about the texture and taste. Somehow the cookies are different than mine, mine are brownish in color and yours are very pale and didn't flattened too much. Maybe your dough was thicker than mine. The dough has to "sprout" while baking. Try to use less flour... I am thinking that you used local flour which I am not familiar with at all. Reena I only used my thumb to make the indent. 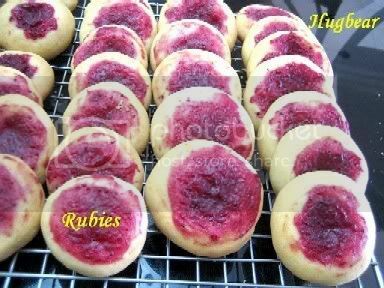 Those rubies in the picture were my 2nd batch, which I didn't bake till golden brown, so texture wise they were slightly softer and not as dry. My 1st batch, I baked till golden brown and I found the texture to be crunchy and dry. While baking the dough did "sprout", but not sideways or as much as yours. I measured 1 tsp of dough, made it into a ball shape, placed it on my baking try and made the indentation with my thumb. I had followed your ingredients exactly, except I reduced the sugar to 1 cup. For the flour I used plain flour. Should I use cake flour? After chilling it in the fridge for 2 hours, I still found the dough to be sticky, so I dusted my hands with flour whilst handling the dough. Is this wrong? On the method, I just mixed everything together (beat egg, then wet ingredients then dry ingredients). Could I have mixed my ingredients wrongly? Overall, although my rubies aren't as nice as yours or as soft as yours, it is still a hit, taste wise. My dd loved it and she is bringing 50 of them to her sleep over tonight. It is so fragrant that my "baby" (3-year old golden retriever) "stole" a piece from the cooling rack. Linda, I know they are delicious, no matter the shape or the color. I will make another half batch tomorrow, and see what is what. The first time I made them was Christmas and will be again... but I need for my sake to find out, where is the difference between yours and mine. Give him a smooch from me. Oh please do let me know if you do find out what I did wrong. I much prefer your rubies to mine. 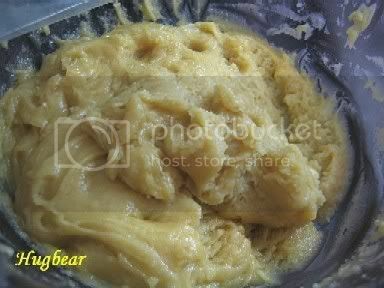 Last Christmas I made like 4 batches in one... well all in all was good up until I started to form the dough. Sticky but very oily. At that time I don't know whether the flour was different and the oil was too much because dough was oily, so I though when I wrote the recipe that I cut the oil in half. The original recipe stated 1 cup of oil... so do add instead of 1/2 cup... add 1 cup. The dough will be sticky but don't use flour for your hands, use oil. Either way they are good, I made both with 1/2 cup oil and 1 cup oil and they are to die for. That's all... the baking is still up to your oven 15-20 minutes. These cookies are very very good and even if they are crunchy after baking, they will melt in your mouth the next day. The dough is very fluffy and the cranberries makes them very tasty. You will not regret making them at all. I am going to make today a full batch for my nephew. He like this kind of cookies very much. One full batch would make 60-80 cookies, depend of how big the ball is. Thanks for finding out what went wrong with mine. I should have oiled my hands when shaping the dough instead of flour. Will definitely bake them again. I even managed to find fresh cranberries to do the sauce. 1 batch will make 80 rubies, if the size of the ball is 1 tsp size. I am baking mine at the moment and found their texture similar to rock cakes and abit sweet. I followed the recipe exactly. ALthough I am going to see if tomorrow they are better. They don't look as good as yours but the tip for jam mixed with cornflour worked a treat! Oh yeah, I forgot to add that I used seedless raspberry jam instead of cranberry jam. Kitchen is smelling very very nice! Hi Vi, here are my rubies. I used 3/4 cup of oil instead of 1 cup and I cut down sugar to 165 gm which is just nice for me. Vi, should the dough be looking like this or it should be more oily? Yes LeeLee, that how the dough should look. It was because the dough looked this way that made me reduce the oil to 1/2 the cup. But remember, it is the oil that makes the cookie very tender the next day and they are so nice an melting in your mouth. See how you like the cookie with only 3/4 cup of oil, if it is ok than use what make you happy. In my opinion no mater if 1/2, 1/3 or 1 cup of oil is used, either the next day or 3rd day they'll be very soft. Don't be afraid to make the intentation a bit deeper and wider. But your cookies are looking just like my first batch. Not bad, my domestic helper loves it. I am keeping a box just for her. The rest I gave it to my hubby to share with is colleagues. I am still nursing my sorethroat so I only took 2 pieces. Thanks for sharing this recipe with us.